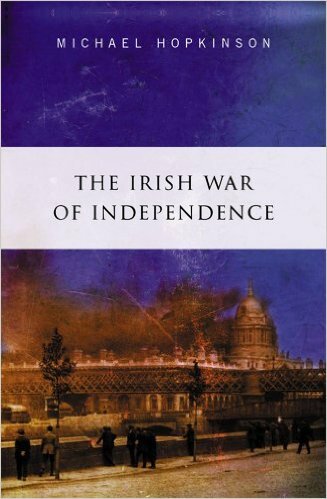 The Irish War of Independence. Michael Hopkinson, Gill & Macmillan, 2002, Dublin. pp XV+274. Written on March 3rd 2004 and edited on March 23rd 2015. 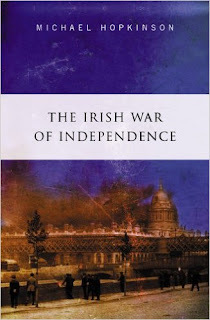 I read The Irish War of Independence by Michael Hopkinson in June 2003. I had previously complained that no definitive history of the War of Independence had been written. This work by Hopkinson partly fills the gap. This episode has on the one hand been outrageously propagandised as a leading episode in waking up the country and particularly waking up General Headquarters staff; it has many regrettable and unwarranted features; it took place on the day that the Dail was been assembled for the first time and a Dail government established. 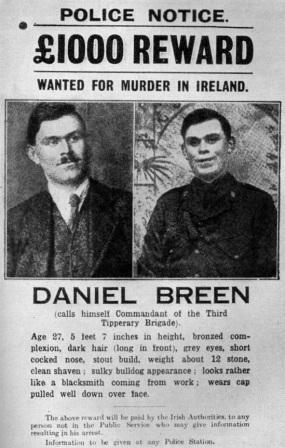 -- bloodshed should have been unnecessary in the light of the type of episode it was; it completely disturbed the general public situation in the area; and it pushed rather turbulent spirits such as Breen and Treacy into the Dublin area from time to time, where their services were not required and their presence was often awkward. 1917 Terence MacSwiney wedding. Dad on right as best man. 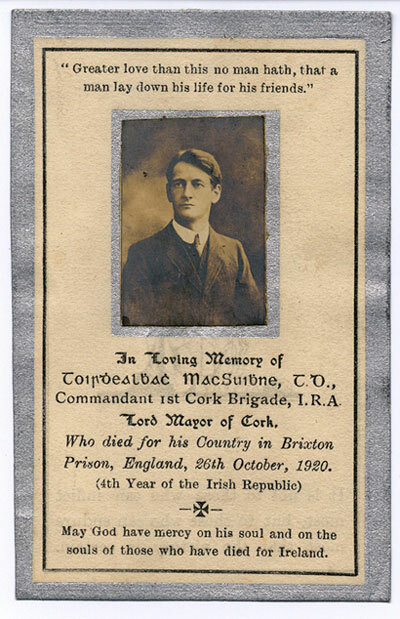 It is quite clear that the War did not take place until Mulcahy as chief of staff and Cathal Brugha as Minister for Defence, in association with Terence MacSwiney in Cork, arranged for the destruction of the RIC barracks countrywide, a policy which commenced in January 1920. The date of the War lasted for almost exactly 18 months from this time. Chapters 6 (British Security Forces) and 7 (British Policy at the Cross-roads: April-August 1920) deal with the war from the British perspective. Hopkinson refers to the poor organisation and incompetence of Dublin Castle and the poor co-operation and understanding between the Dublin administration and Westminster. He also underlines the disastrous relations between Dublin Castle and the British army and the RIC. He notes the frequent failures of the British Cabinet to act on the advice of their Dublin colleagues, and the unresolved conflict which existed between the British army in Ireland and the RIC. At no time during the War did the British succeed in uniting their military forces into one properly lead and unified group, a move which was frequently urged by the head of the army, Macready, and others but never taken seriously by Westminster, partly because the British were unwilling to admit internationally that they had a war on their hands which required little more than police intervention. Mulcahy, in his memoirs, was of the same mind as Macready that a unified force properly equipped and lead would have brought the guerrilla activities of the IRA to an end in a matter of a week or two. He expressed this opinion during his speech to the Dáil during the Treaty debate. Chapters 19 and 20 deal with the Truce and the peace process. Both are relatively short chapters but are of particular importance. There were attempts to reach a settlement between the Irish and British during the eight months before the truce in July 1921 but all these efforts came to nothing. These failures arose partly because of difficulties in making contact with responsible representatives of Sinn Fein. Despite his being back in Ireland for more than six months before the actual truce after his return from America, De Valera made no attempt to seek a truce with the British nor was it easy for Dublin Castle to make contact with him despite the widespread anxiety on both sides for a settlement. This was the view of Sturgis in his account of the time. 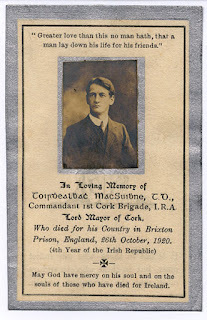 MacSwiney died after 74 days hunger strike. Above all, however, Hopkinson puts most of the blame for the senseless continuation of the war on the shoulders of Lloyd George because of his increasingly hawkish approach and his intractable attitude to Sinn Fein and the IRA. 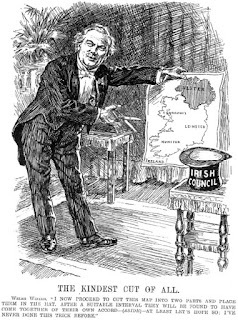 In justice to Lloyd George, his optimism in quelling the Sinn Fein rebellion was at least partly due to much misinformation about the situation in Ireland and to hawkish pressures from conservative colleagues such as Wilson and Churchill. And the Irish Secretary in the Westminster Cabinet, Hamar Greenwood, lacked the ability, the insights or the political noose to bring the two sides together to create a more favourable ambiance for a meeting. Should de Valera after his return to Ireland at Xmas 1920, and perhaps with advice from Childers, not have made a move on the political front or would such a move weaken his position on the national side? 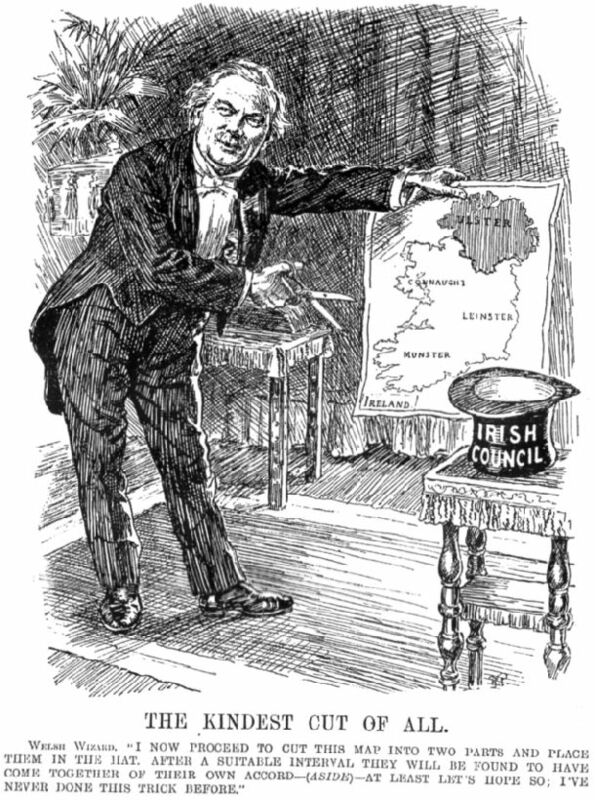 When he was a young Liberal member of parliament, Lloyd George was opposed to the Boer War and strongly favoured Irish Home Rule. His tenure of the premiership of the Coalition from 1916 to 1922, with its majority of Tories, appears to have changed these sympathies and to have lead to a characteristically Tory antipathy to the Irish and Irish nationalism. His refusal to deal with ‘the murder gang’ and to demand decommissioning of arms at the time of the Clune offer to organise a truce in November 1920 and Griffith’s willingness to negotiate was a disaster. A settlement at that time would have avoided the worst aspects of the war which occurred during its last six months, the increasing casualties which prevailed at this late date, the bitterness which prevailed between the black and tans, the auxiliaries and the volunteers which provoked our tragic civil war. The general headquarters staff of the IRA is mentioned extensively in the chapters dealing with the struggle outside Dublin but the reader is left with little insight into the role of GHQ during the War. GHQ surely merits a separate chapter to explain its functions and its increasing influence during the war, its policies in relation to effective military strategies, appointments, executions, ethical considerations and other aspects of central control. While much of the earlier thrust and initiative of the fighters in the field originated in local areas, GHQ gradually extended it influence in the areas of organisation, training, supplies and ethical standards as the war progressed. Collins and Mulcahy are frequently mentioned in the text as representing GHQ in Dublin but a chapter describing the evolution of GHQ since its formation in March 1918, its aim and eventual success to establish the centrality and control of the war on the national scale and its eventual success in establishing the GHQ personnel with their various duties, would be a useful addition to the history of the War. It is important to underline the significance of a well organised central GHQ, aimed at enhancing a military organisation with an ethical and efficient basis. 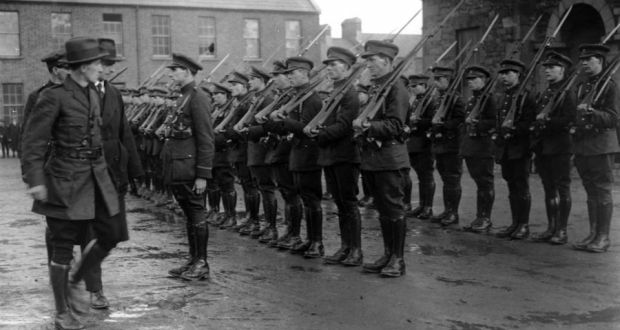 When the Civil War erupted in June 1922 it was to the advantage of the smaller but better organised and coordinated volunteers at GHQ in Dublin to overcome the larger but widely disorganised volunteers in the provinces. 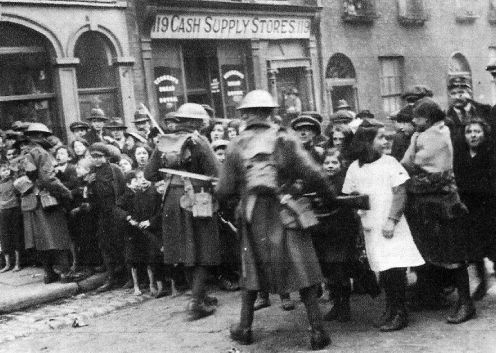 In effect one could say that the outcome of the Civil war was clearly evident when Dublin was cleared of Irregulars after nine days of clearing the Irregulars from the city. 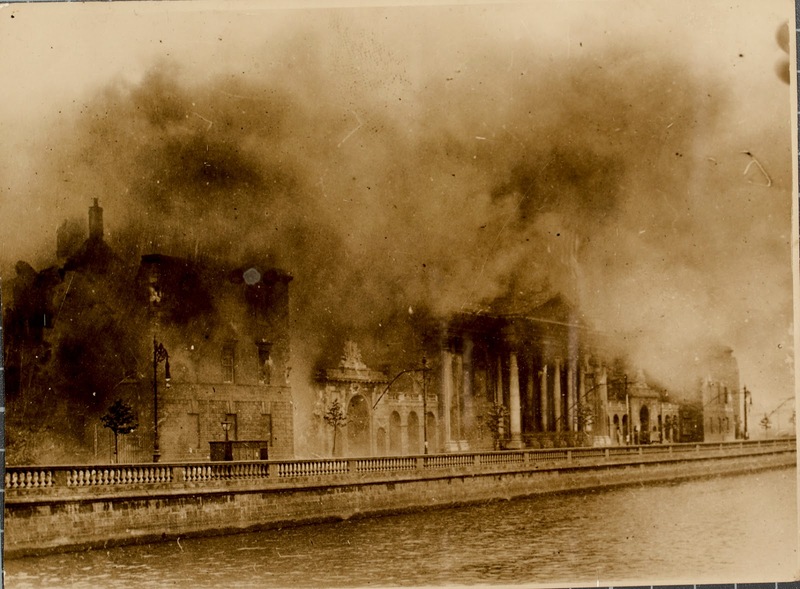 Would it have been different if the Irregulars in Dublin took to the streets instead of remaining cooped up in the Four Courts and in various buildings about the centre of the city? And what would have happened if a better organised Irregular force had planned to attack and used some of the British ordnance still lying about the city? By the time of the Truce in July 1921 there were 13 men on the Staff, all with defined duties and responsibilities. Such a chapter would provide more information about the successes, failures and limitations of the volunteers in Dublin and the provisions, and about their relationship with the Sinn Fein party and cabinet. Despite GHQ’s problems of communication and shortcomings, and the difficult circumstances under which it was placed, divisionalisation planned in early 1921 was symptomatic of increasing influence of and effective control by GHQ during the later stages of the War. Apart from the organisational merits of divisionalisation, separate peripheral divisions were thought desirable because of the increasing threat to GHQ and the security of its membership as 1921 advanced. A definitive history of the War, including details of the GHQ organisation and staff, remains to be written. The subject of this essay has been of considerable interest to me personally because of my father’s role as head of the army before, during and after the War of Independence. 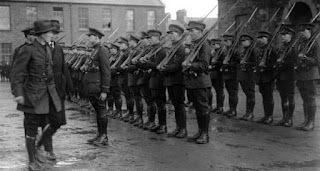 His reputation following his acknowledged guerrilla success in Ashbourne in 1916 lead to his preferment as head of the volunteers after his return from Frongoch. He was appointed the head of the army when it was formed in March 1918. He remained its head until the Treaty was accepted in January 1922. He resigned then and was appointed Minister for Defence. 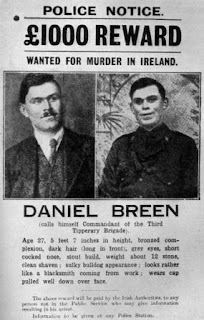 He was reappointed chief of staff on the 29th of June 1922 with the attack on the Four Courts and the start of the Civil War except for the six weeks from 13h of July 1922 when Collins was appointed commander in chief before his death in August 1922. For Collins it was part of protocol to lead the army as head of Government. 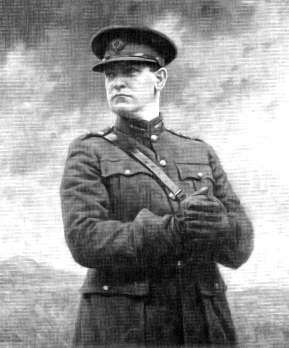 Mulcahy continued as army head until he resigned at the end of the Civil War in May 1923 and continued as Minister of Defence during the Civil War until March 1924 when he resigned at the time of the Army Mutiny. Same again but forty years later. In terms of the military side of Sinn Féin no two people could have been closer in terms of policy, purpose and success than Collins and Mulcahy nor could two people be more different in character and personality. Collins’s character is well known for his open, almost brusque, approach, his energetic behaviour, his qualities of self confidence and leadership while Mulcahy was more measured and calm and far from seeking publicity of any sort. He was an excellent organiser, as was Collins, and he chose his colleagues in GHQ well while acknowledging that they received every credit for their endeavours. And he maintained silence about those whom he found wanting and thus avoided enemies. 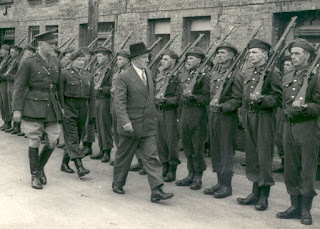 This is surely evident in his maintaining a strict professional relationship with Cathal Brugha, his political boss, despite Mulcahy’s insistence that he kept Brugha, as Minister of Defence duly informed regularly about all GHQ affairs before, during and after the War of Independence as head of the army at the time. His weekly visit to keep Brugha informed was clearly part of his duties. 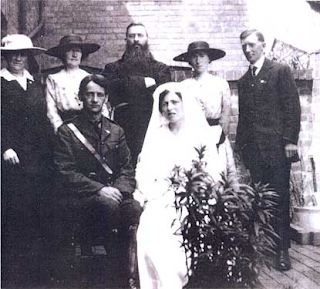 I have referred to Brugha’s lack of respect to my father’s status as head of the army during and after the Truce in my biography of my father. Mulcahy was ‘’a backroom boy’’ in the best civil service sense. It was evident in his dedication to his evidence to work and his commitment to detail and in his enthusiasm and appreciation of activates such as Collins, McKee, Liam Lynch, Seán McEóin, Eóin O’Duffy and others. He was quick to give credit which was deserved by others. On this issue I have never found any reference to my father by Collins, good or bad, but he was not designed to ponder the personal nature of other people as part of his outward looking personality. Nowadays Collins is an iconic figure in Ireland both because of his political and military roles. At his iconic best he usually appears in military uniform. 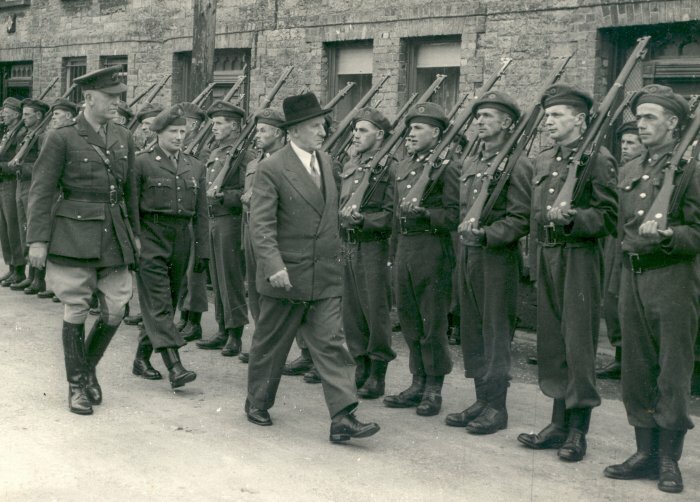 Mulcahy is little known publicly and even within the army his vital role is not apparent among the soldiers and within the trappings of barracks. (In a recent publication of past chiefs of staff his first name is mis-spelt, 2015) He was a devoted and admiring colleague of Collins and was responsible for his tributes, both during Collins’s lifetime and particularly after his death. His tribute to Collins at his graveside stands as one of the finest orations of recent times. About a third of the book is devoted to the guerrilla war in Dublin and the provinces. These chapters I found to be a little tedious, partly because of the selective and repetitive nature of the activities, and partly because, from the historical perspective, to be comprehensive it needed a book of its own. Although he clearly outlines the main methodology of the war in the provinces and the crucial importance of leadership in effecting and coordination military activity, I have some sympathy with the author who must have found it difficult to present this material in a readable and comprehensive way.